Mount Airy Contemporary Artists Space (MACAS) is pleased to present artwork by Philadelphia artist Erin Murray and New York artist Mark Masyga. Erin Murray’s crisp paintings of commercial and residential buildings borrow from the language and grammar of portraiture: these structures are depicted as individuals, wearing the evidence of their personal histories on their skin/façades. Presented in the foreground, in full frontal or 3/4 view, with minimal background noise, these buildings gaze back at us. In these paintings, there is no architect or planner; these buildings are the sum of an accumulation of small daily decisions, accidents of weather, and the many and small imprints of their various and serial inhabitants. Buildings can be humble, vain, weary, silly, sincere and beautiful - when we say a building has character, it’s really a shortcut for saying “this building has humanness - it’s humane because it is human”. To anthropomorphize architecture, as Murray does in this work, is to mirror back our own essential natures to us. Mark Masyga’s paintings and sculptures share a sense of architectural implosion. Things fall apart, fall together, fold, sprout. Masyga’s paintings especially convey a sense of orderly linearity attempting to rise out of chaos, architecture unfolding like reverse origami from an impossibly crumpled sheet of paper. Masyga’s sculptures speak to compressive weight and physicality, of lumber and concrete. There is the sense among the chaos of plywood sheeting and 2x4s that here, too, order may arise, defying entropy. A smartly paired two-person show of paintings and sculpture by Mark Masyga and paintings by Erin Murray has one more Saturday to go at Mount Airy Contemporary Artists Space. 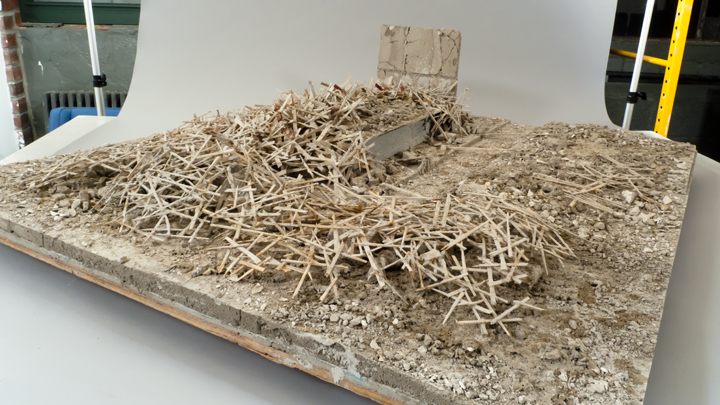 Masyga’s paintings of stacked rectangular forms suggest the detritus common to industrial sites, such as unruly piles of wood pallets; that impression is bolstered by his sculptures of wood, plaster, Structo-Lite, and actual detritus that are surely meant to be his own table-size demolitions. 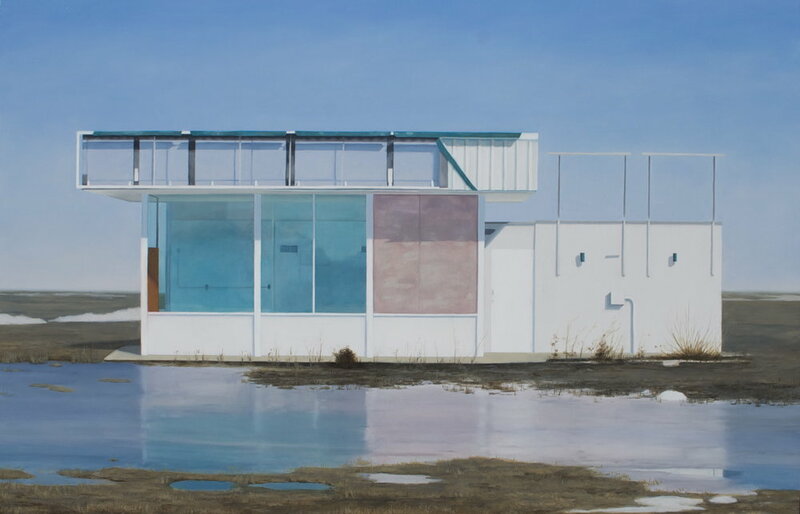 Murray has painted a series of modernist-influenced houses and commercial buildings that are the poor relatives of the elegant glass rectangles designed by Mies van der Rohe and Philip Johnson. These less fortunate structures have fake mansard roofs slapped on top of them, enormous front windows that reflect the hideous hodgepodge of architecture across the street, or are, perhaps, an abandoned gas station or a two-story early version of the strip mall. But Murray infuses her knock-off architecture with a dark sense of humor. The top of a pine tree sticks up incongruously behind a one-story office building, right in the middle, like a bizarre ornament, in Executive Mansardic; the abandoned gas station in Miesian Influence Loop is shown from the back, as if embarrassed.